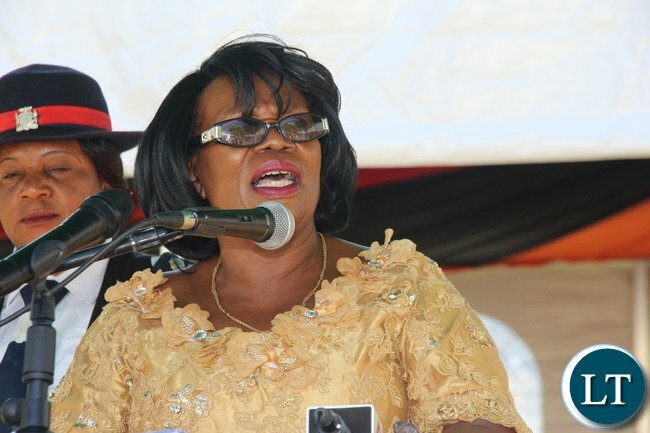 The Minister of Higher Education Nkandu Luo says Government will starting in 2018 introduce Entrance Examinations for students before they can be admitted in colleges and Universities. Professor Luo says the move will help institutions to admit students who passed genuinely without any leakages at grade twelve level. The Minister says Government want to have students who will take learning seriously. Professor Luo was speaking in Mkushi- this morning when she called on District Commissioner Luke Mwamba. And Professor Luo says appropriate action will be taken on students who will be found wanting from the riot that took place at the university of Zambia in Lusaka. She says Government would like to clean up higher institutions of learning of hooliganism. Professor Luo has since urged parents to help counsel and discipline their Children before they get into learning institutions. And Professor Luo says Government will come up with a deliberate policy that will cater for rural population on Bursaries. The minister says she is aware that a big number of students benefiting from bursaries are those in urban areas . Professor Luo says this is in line with President Edgar Lungu’s directive that no one should be left behind in sharing the national cake. This should have been put in place by now. Most countries have College entrance exam. The other issue that the Ministry should look into is plagiarism in Colleges and Universities. Higher institutions of learning should have systems where students submit their ork electronically so that the ork can be scanned for plagiarism. That’s not the solution to leakage Honorable. Even the entrance examinations will be leaked. If you can’t deal with grade 12 level problems how can you deal with University sophisticated leakages? But entry exams will be leaked too. I dont understand why we make college education so difficaulty and special. We need as many of our kids to obtain college degrees and diploma. If anything we should do away with grade 7 and grade 9 exams. Kids mature differently; some are late bloomers. Condeming a 13 year old at that age is so cruel.The more people with college education the better. It is just an education. No CHILD LEFT BEHIND! I thought this was being done already. Grade 12 is only for initial shortlist and final selection to be based on successful entrance exam, simple. Id!ots have just been walking into Engineering Class without validation of their mental preparedness. Sh!t. Now just look at the quality of our Graduates. Pile of rubbish. Entrance exams may not solve the problem. Find ways to stop these leakages. What steps will you take if the entrance exams start Leaking? @Uncle Sam, There will be another level of entrance exams that will be intended to catch those that leaked the first level of entrance exams. And for those that leaked the second level of entrance exams will be caught at the third level of entrance exams and so on. This is how our whole Professor Luo thinks. Thanks for the insight Tenze. I think this is a mess. In countries where they do metric or exams after form five the degree is for three years and four years. Let Universities have options to admit at form five or students take three years after this additional exam. For instance University of Pretoria it is three years after you have written this exam. PF govt doesn’t plan. You will see the confusion that will arise. It will not be smooth. It may end up delaying students going to the University. The question is, do these Zambian Unviserties offer quality education? Whether the students write Nkandu Lui exams or not provided Universities are not offering quality education it does not make any difference. What will happen to mature entry? it had always been normal practice to test applicants’ aptitude skills before entry into any program of choice. The problem which is there, is corruption. Even college entrants exam will be leaked , as long as those lecturers need money. Zambians respect tough laws. People were vandalizing Zambia Railways rails when they acted the law that anybody found wanting vandalizing the the Railway Lines who go to jail for 25 years. Nobody touches the rails . Why can’t you do the same. Most of those leakages come from the children of politicians and those with money. So the law will be soft because the players are superpowers. Mangufuli the president of Tanzania, had sacked over ten thousand civil servants . How many people who work in government and private companies have fake qualifications in Zambia, millions. At UNZA for science students you have NS (Natural Suffering) I think first year in NS is the hardest entrance exam in Zambia whether you used a leakage to go there or whether you used a leakage at the exam ni wawa kupona fye nga tamwakwata amano.. I think the minister has admitted that leakages are there,now where is the source of these leakages? Entry Exams Are Not The Solution Mwebanthu. First Remove Leakage At Grade 12. Dr. John Phiri Did It Pa 2014 And 2015 Exam Years. And I Wonder Who Brought It Back Pa 2016 October Exams. Coz Even 2016 GCE There Was No Leakage. We Even Find It Challenging To Go And Study Abroad Even If Somebody Has Good Results. Even If U Introduce That Leakage Will Follow Because Political Players Will Be The First People To Bring It In Order For Their Children To Be Given A Place At University. Just introduce cumulative marks at Secondary level. The one-off exam at final grade attracts leakages.